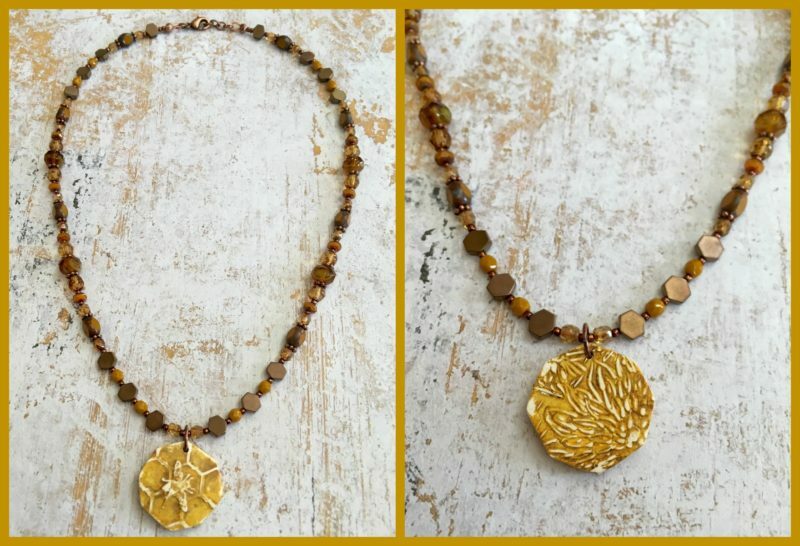 I’ve been buzzing with excitement to share all my bee themed jewelry creations that Art Journey Three has inspired me to make… and it’s finally time! 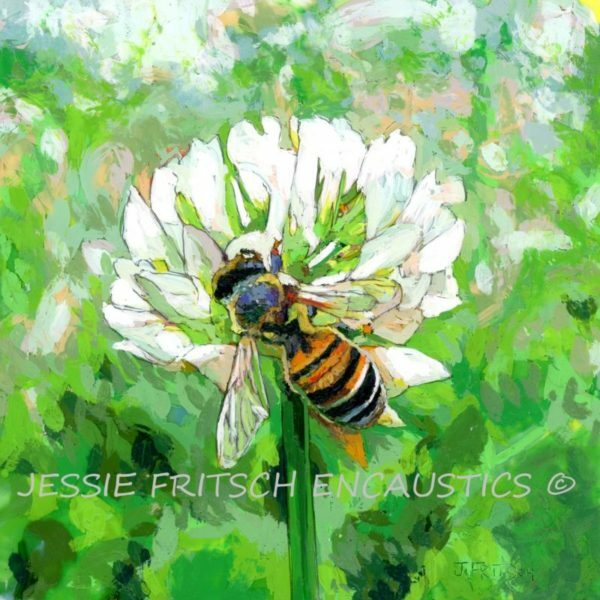 I just love the details that Jessie Fritsch achieves in her pieces, and I’m especially smitten with her artwork that is just focused on the bees or the bees against honeycomb so I decided to share just bee-themed jewelry this post. I plan to share some designs a bit more focused on the floral aspects of the inspiration artwork in a couple of weeks. I’ve had a few beautiful wood burned and hand painted components from Ashley Bonney of Summer Wind Art in my stash for awhile. 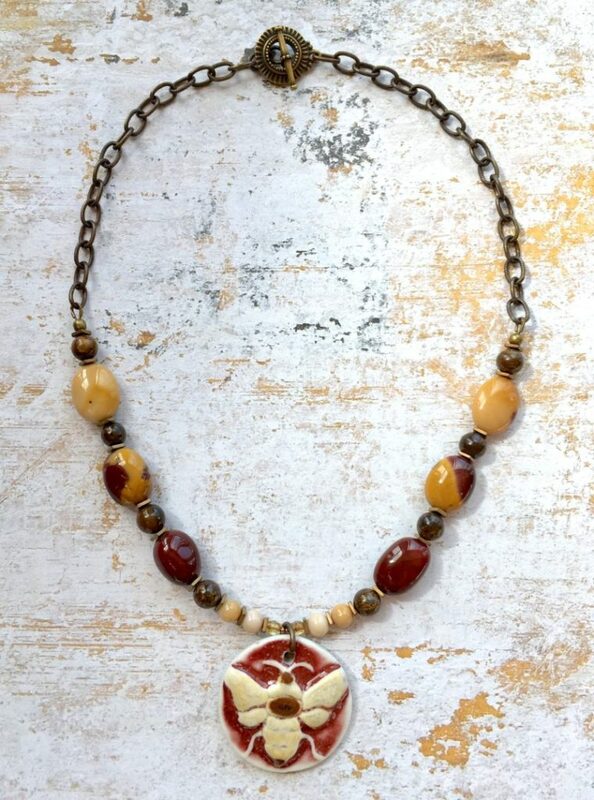 (True confession, I just added the pendant from her that I shared in my last post to my little collection but it didn’t arrive soon enough for me to make something this time.) 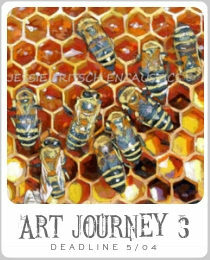 There seemed no time like the present to whip up a little collection of bee-themed jewelry than this Art Journey! First, I made two bracelets that are similar but slightly different. I started with the one on the left… initially thinking it was going to be a necklace. As I played with the beads and Ashley’s lovely wooden component, I realized that they wanted to be a bracelet! The one on the right is a little bit longer than the first and will be perfect for a larger wrist. 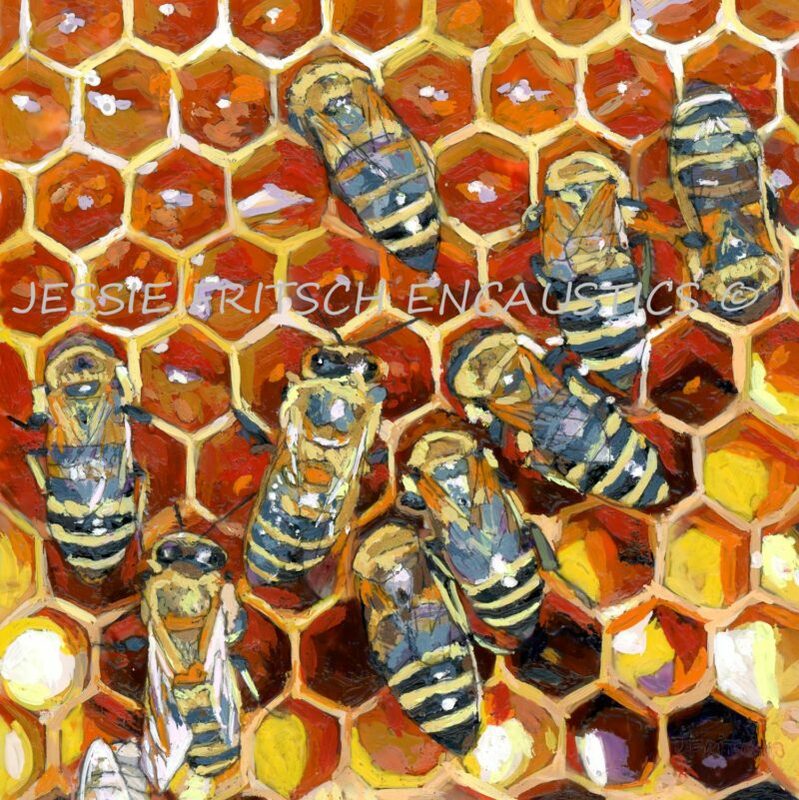 I’ve had the bright yellow Czech glass rounds for ages and I bought them because they made me think of honeycomb and bee hives. These bracelets were a great opportunity to use some of them. 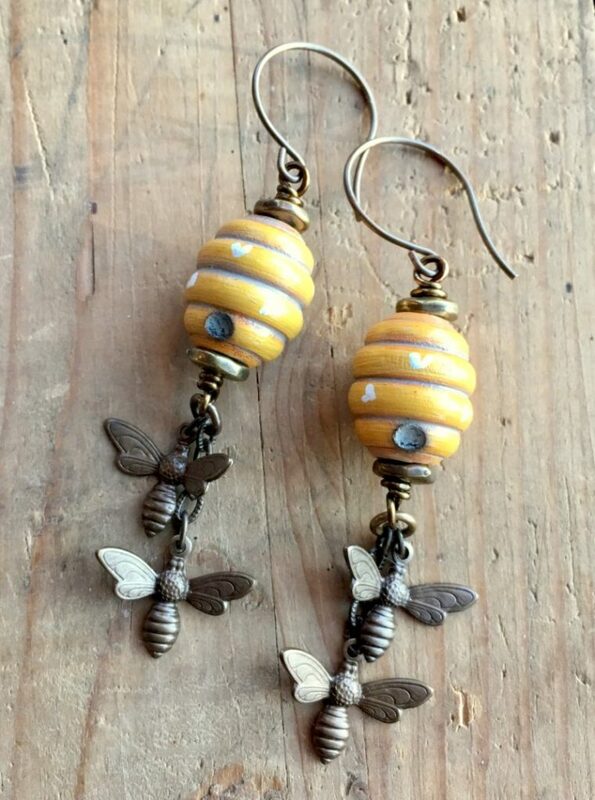 Next up, I grabbed my Summer Wind Art bee hives for some fun earrings. I added a couple of little brass bee charms dangling from chain to the bottoms of the hives to simulate bees coming back to the hive. These babies are super lightweight despite their size… gotta love wood beads! 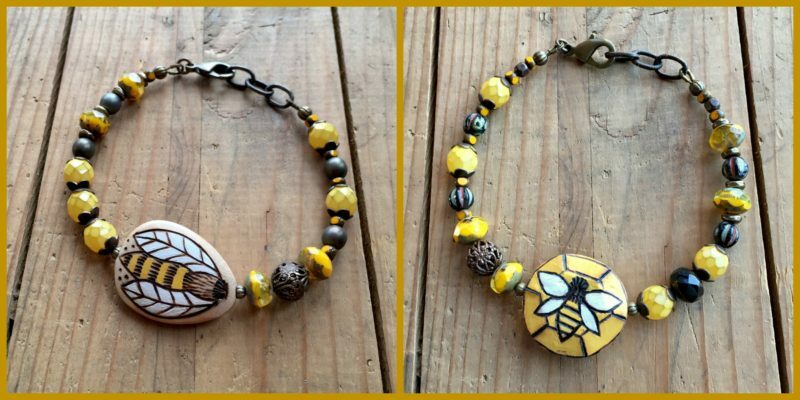 I acquired a couple of ceramic bee pendants by Keith O’Connor in an Allegory Gallery destash event a while back. I decided to play with the bolder of the two pendants. The more I thought about the pendant, the more that I thought that mookaite would be the perfect accompaniment. I strung some mookaite nuggets and rounds mixed with bronzite and cool square plated hematite spacers and finished off the back with brass chain. With more pendants hanging out on my bead board, I kept trucking on making necklaces. 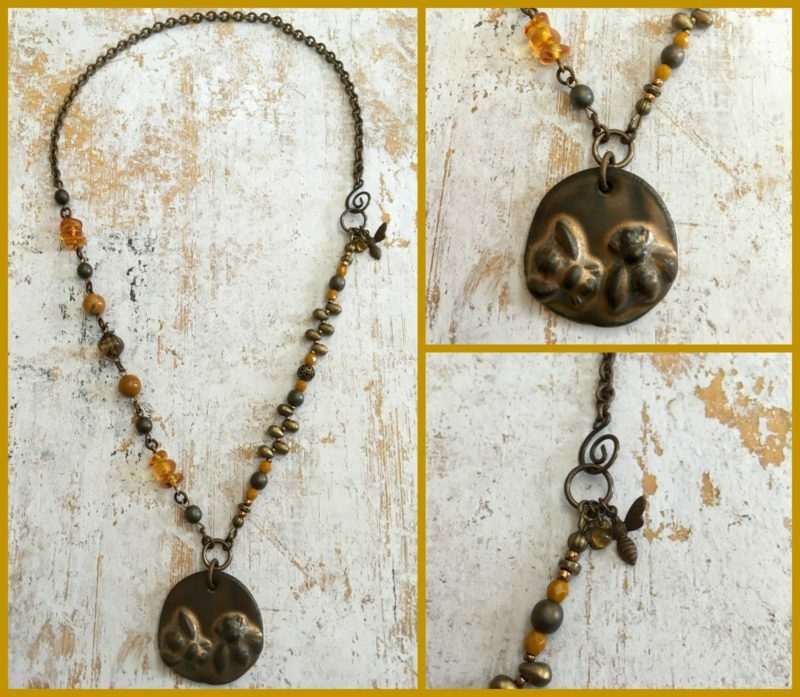 For my next trick, I started with a bronze glazed ceramic bee pendant from my friend Tracee Dock of The Classic Bead. This time I wanted to go asymmetrical so I did a mix of of links and stringing with brass chain in the back. I feel like the amber and golden yellow jade keep it from being too dark. From the moment I saw the Art Journey Three Artwork, I knew that I wanted to use some of my favorite plated hematite hexagon-shaped beads… it was just a matter of what I wanted to pair them with. 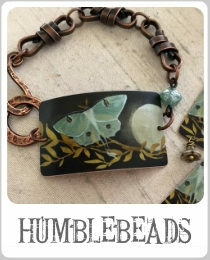 I finally landed on one of Heather Powers’ bee and honeycomb pendants. I love that this pendant is just as lovely from the back with it’s floral pattern as it is from the front. You can get one of your very own in her Humblebeads online shop. I thought that I was all out of bee ideas for the moment (but not out of bee beads, for sure!) but I still had some things out on my bead board. 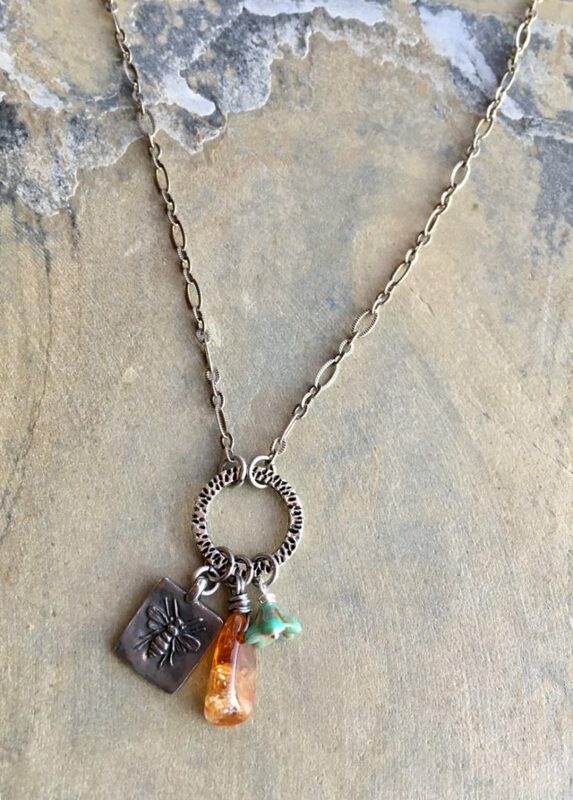 I decided to whip up a simple charm style necklace with an adorable little bee charm from Green Girl Studios (it says Sweet Honey on the back), a Czech glass flower and a piece of Citrine. Easy peasy! Sometimes I have to remind myself that every creation doesn’t have to be a major production. Whew! Thanks for sticking with me through all of that! 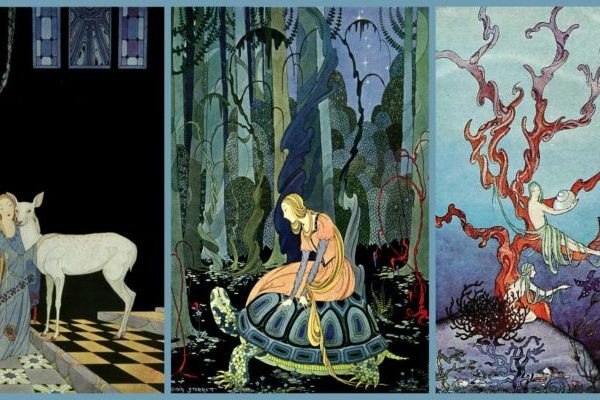 I hope that you will remember to add your own Journey Three Creations to the Gallery for us all to see. 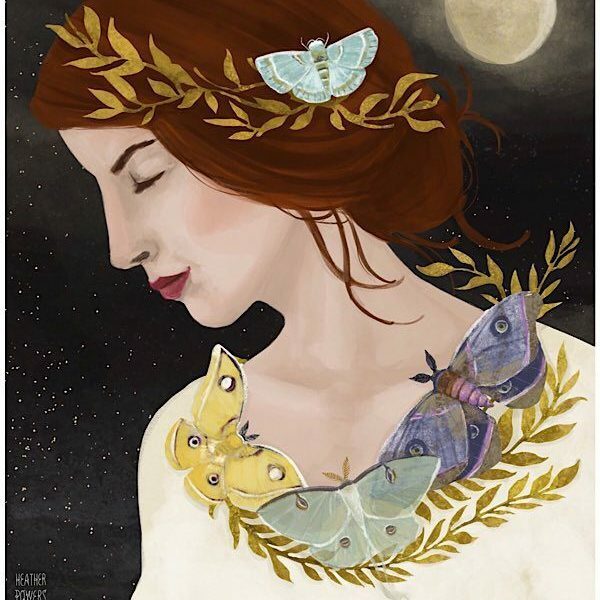 (Don’t forget that you get a chance to win fabulous art-beady prizes from one of our contributors for each entry… no limits!) 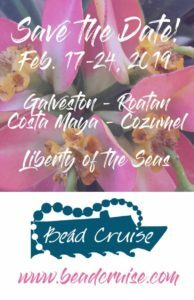 See you in a couple of weeks!